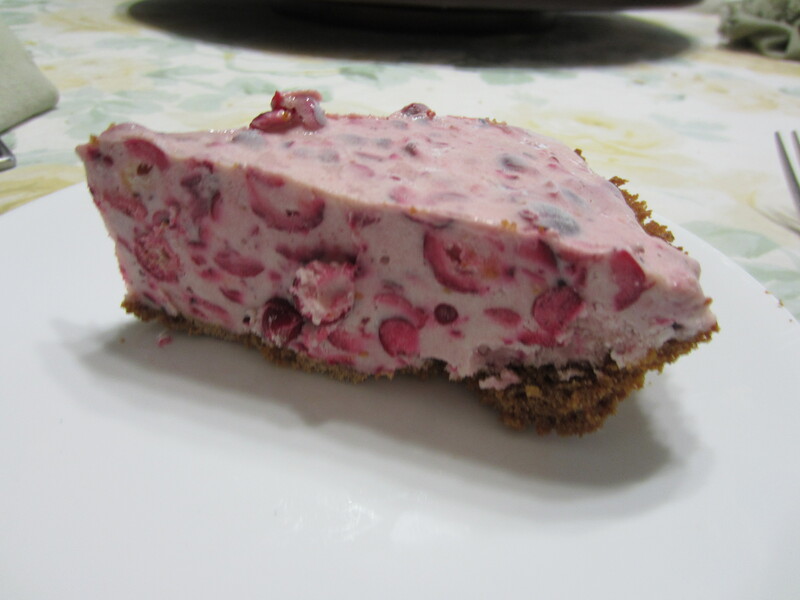 For an article I was writing elsewhere, I called my mom for the directions to cranberry ice cream pie, a staple of our holiday table when I was growing up. In a strange turn of events, this is a not a recipe posted in a zillion other places. In my usual fashion, I tinkered with it. And that’s what I am posting here. In food processor or blender, thoroughly combine condensed milk, lemon juice, vanilla and cream cheese. Fold or pulse in cranberry sauce. Pour into crust. Freeze till firm. To serve, let soften for ten minutes at room temperature. Garnish with whipped cream, or not. *Quick-ish homemade crumb crust: in food processor whiz 6 ounces gingersnaps or graham crackers. Pulse in 2 tablespoons melted unsalted butter. Press crumbs into 9-inch pie plate. Bake at 350F for 10 minutes. Cool pan to room temperature on wire rack, then fill. **Quickish homemade cranberry sauce: Combine 2/3 cup water with 2/3 cup sugar, bring to boil in medium saucepan till sugar dissolves. Add 8-ounce frozen cranberries, return to boil, lower heat and simmer for 10 minutes. Let cool to room temperature. Did you know Northeast Minneapolis’ Art-a-Whirl is the biggest artist open-studio event in the US? And it’s this upcoming weekend, from Friday May 16 to Sunday May 18. Over the years, I’ve learned a few things about Whirling with little ones, which I wrote about for Minnesota Monthly’s TC Taste blog here. But it’s a good set of links even if you don’t have little ones. And even if you don’t live in the Twin Cities, you can check out the art online. And, please do. Because in writing that post, I put all the links in my draft, and they didn’t copy over to the final, so I had to enter them all again. Which was a giant pain. So go, read, and click the links, to justify all that hard, hard work, if you would, kind readers! 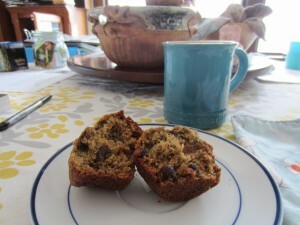 Technically, these are Espresso Chocolate Chip Toasted Walnut Whole Wheat Banana Muffins. A$$load of Adjectives Banana Muffins? Bada$$ Banana Muffins? I still have this brain-eating virus, so I’m cursing a lot. Not sure I’m very far off from Flowers for Algernon, here. Sorry if the cursing offends. Call them what you will. They turned out good. I’m sure I’ve shared something like them before, but this was today’s iteration. Banana Muffins With a Bunch of Stuff in Them, a mashup of recipes from Baked, Super Natural Cooking and an index card recipe ca. 1998 that came either from the Philadelphia Inquirer or The Star Tribune. 1. Oven 350. Spray 12-cup muffin tin. 2. Stir together butter, bananas, sugars, dairy item and egg in a medium-small bowl. 3. Whisk together flour, espresso, soda in a medium-big bowl. 4. Put wet ingredients into dry. Stir till just mixed, then fold in chips/nuts. 5. Using ice-cream scoop fill muffin cups 3/4 or so full. Bake 20 minutes till tester comes clean. 6. Cool pan on rack 15 minutes. Remove muffins, cool rest of the way on rack. Muffins can be stored in an airtight container for a few days. Like they’ll last that long. Mmmm. There it goes down, down in my belly. Fear not, friends who know I’m a teetotaller. I’m not talking about Ron Burgundy’s scotch. Or Ron Swanson’s, for that matter. I’m talking butterscotch. 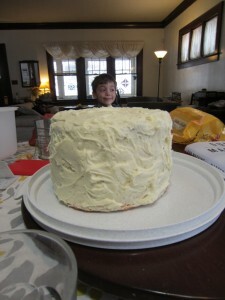 It started with the strawberry cake that about-to-be 7yo Guppy requested for his birthday. 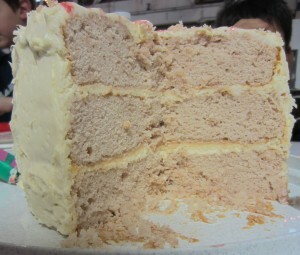 After making the cake, I had eight egg yolks. What to do? Make pudding! Jennifer Reese of Tipsy Baker’s recipe for Butterscotch Pudding from her book Make the Bread, Buy the Butter calls for 4 egg yolks. Four is exactly half of eight. (Who said fractions aren’t important?) It was a sign from the Kitchen Goddess (who I’ve tentatively identified as Hestia; what do you think?) I could make a double batch! And so I did; the recipe is below. Butterscotch pudding has become a comfort-food dessert at many restaurants around the Twin Cities. Now I can satisfy my craving for it on a whim. I’m not sure if this is a good or bad thing. But perhaps that’s because I made a double batch, which seemed excessive after a while, even for me. I suggest that you make a single batch. Unless you have 8 egg yolks. Then, what else are you supposed to do? Reese advises 1. adding a teaspoon of Scotch or bourbon with the butter and vanilla, 2. straining the pudding before putting it in containers, and 3. using small ramekins or teacups for individual servings. 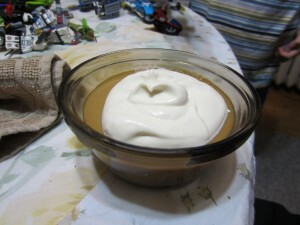 But I was impatient for pudding and serving it to small children, so I skipped the Scotch, straining and separate cups. The pudding was still delicious. 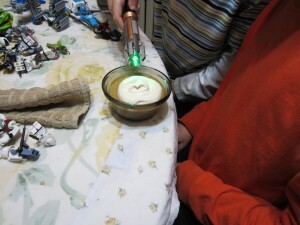 Alas, what I couldn’t skip was my conviction that the pudding should be topped by whipped cream. Reese’s recipe for whipped cream is simple; it’s below. Now, the dead-simplest is to get some cold heavy cream and whip it, which can be arduous if you do it by hand, but goes fast with a hand-held mixer. But adding a little sugar and vanilla does make it even better. 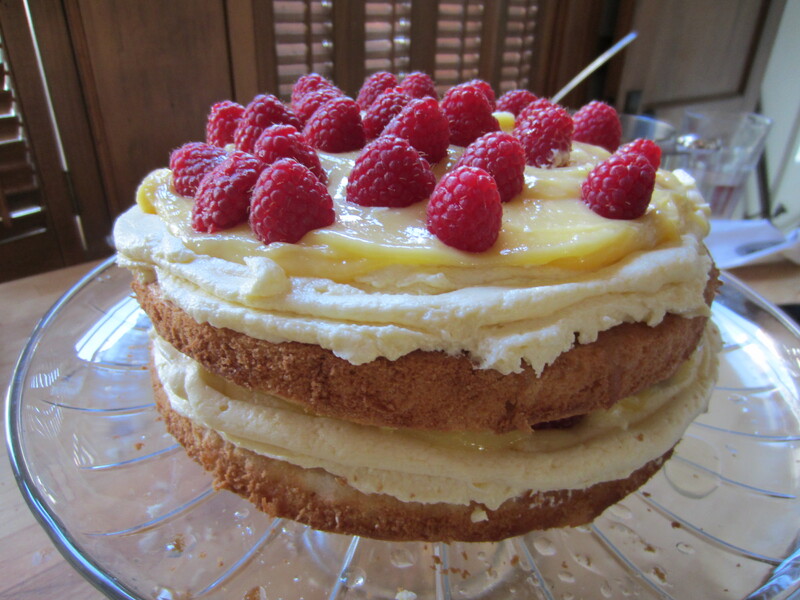 But, the trouble with home-made whipped cream is that it doesn’t keep, it weeps. One way to combat this is to store it in a metal sieve over a bowl, but this tends to dry out the cream. I found another idea in the Genius Recipes archive at Food 52. 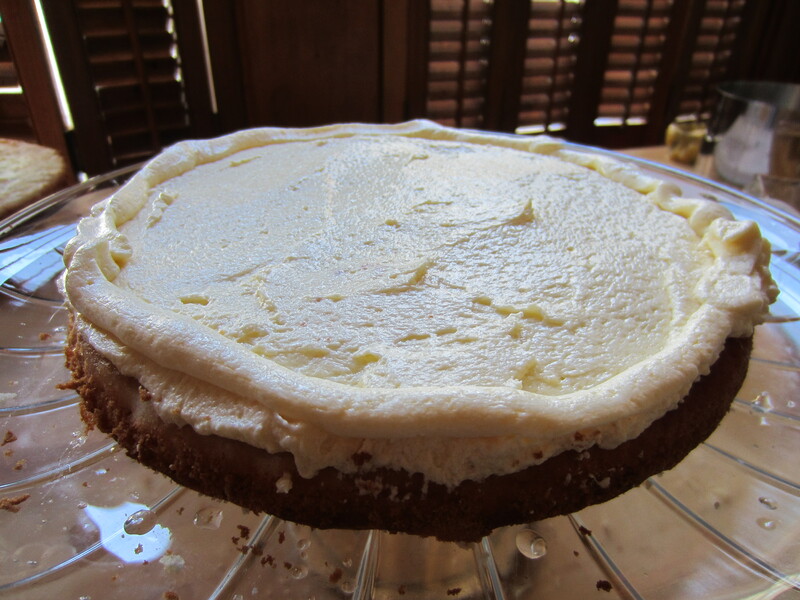 Nancy Silverton adds creme fraiche to the whipping cream to stabilize it; recipe below. So back I went to Reese’s book, as she has a ridiculously simple recipe for Creme Fraiche though it takes 24 hours; recipe also below. Ah, so then, was I satisfied? Oh, no. I’d gotten a taste for butterscotch, so my mind turned to my favorite cookie from childhood, the oatmeal scotchie. I tweaked the recipe from Cook’s Illustrated, which was in turn a tweak of the back-of-the-box recipe I’d made going up. I upped the amount of salt a titch, and can testify that it only makes these more crave-able. But, perhaps you are not a butterscotch person. My friend Becca has a theory, which is that people either like it or not, they’re not indifferent, and those who do like butterscotch tend to also like coconut, and not liking butterscotch usually means not liking coconut, too. (What math property is this? Transitive? Commutative?) Feel free to add evidence either way in the comments. So if you don’t like butterscotch, use chocolate chips. Do not use raisins. I have coined a term: RAISIN-TMENT, which is the bitterness I feel and taste when I bite into a cookie expecting chocolate chips, and get raisins instead. Then I give the cookie away, appearing generous, but really being self serving. Or not, as the case may be. Also, remember, pudding can be deadly. Be careful out there. 1. In a medium saucepan, bring the milk to a boil. Remove from the heat. 2. 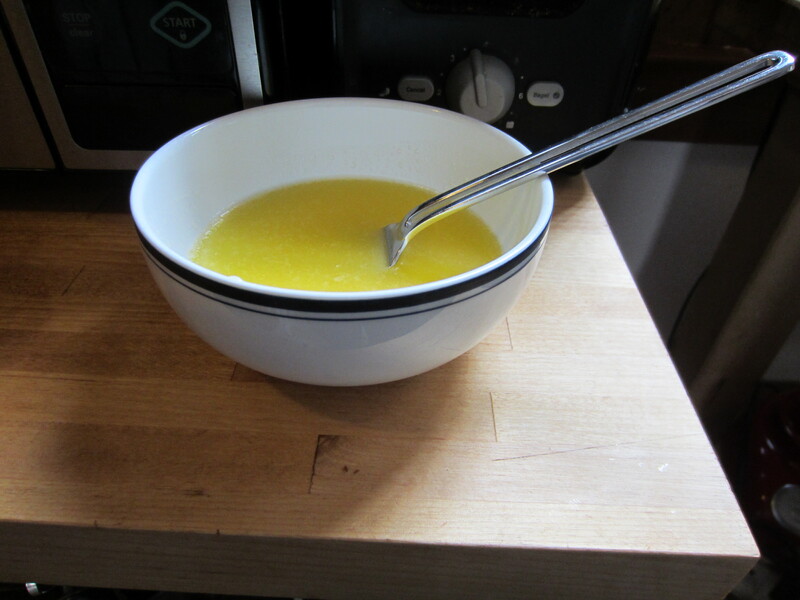 Meanwhile, in a large bowl, whisk together the cream, egg yolks, sugar, cornstarch, and salt until well blended. 3. Pour a splash of hot milk into the egg yolk mixture, whisking constantly. Gradually whisk in the remainder of the milk. 4. Pour the mixture back into the pot and cook over medium heat, whisking constantly, until it begins to thicken, 3 or 4 minutes. Do not let it boil. 5. Remove from the heat and whisk in the butter and vanilla. 6. Transfer to glass container, cover and chill for at least 4 hours until firm and cold. Pour the cream and sugar into a large bowl* and beat until soft peaks form. If you want to use vanilla, add it after peaks have formed. Serve immediately. Makes 1 3/4 cups. Pour the cream and buttermilk into a jar, cap, and shake. Leave in a warmish place–like beside the stove–for 24 hours, until thick. Refrigerate. It will keep for up to a week. Makes 1 cup. To whip by hand, you need a very large bowl and a large, balloon-style whisk. The large bowl is necessary to be able to whip the cream vigorously without making a mess, and the style of whisk is very important: If you whisk is too small or has too few wires, it will take much more effort to whip the cream. Whisking vigorously, it should take about 3 to 5 minutes to bring the liquid cream to the proper consistency. By machine, start on low speed until the cream thickens enough not to spatter. Increase the speed to medium high and continue to whip, stopping the machine before the cream will hold soft peaks. 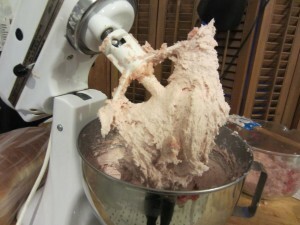 Remove the bowl from the electric mixer and finish whipping the cream by hand with a whisk. Fold or gently whisk in creme fraiche. Note: Salvaging extremely overwhipped cream can be done. You must add up to 1/4 cup of cold whipping cream and work it in, stirring with a rubber spatula to restore the proper consistency. 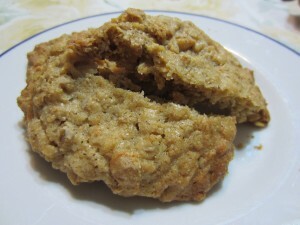 Oatmeal Scotchies, adapted from America’s Test Kitchen/Cook’s Illustrated. Do not overbake these cookies. The edges should be brown but the rest of the cookie should still be very light in color. Parchment makes for easy cookie removal and cleanup, but it’s not a necessity. If you don’t use parchment, let the cookies cool directly on the baking sheet for two minutes before transferring them to a cooling rack. 1. Adjust oven racks to low and middle positions; heat oven to 350 degrees. In bowl of electric mixer or by hand, beat butter until creamy. Add sugars; beat until fluffy, about 3 minutes. Beat in eggs one at a time. 2. Mix flour, salt, baking powder, and nutmeg together, then stir them into butter-sugar mixture with wooden spoon or large rubber spatula. Stir in oats and chips. Reminder: do not use raisins. No one wants them. 3. With ice-cream scoop, make sixteen to twenty 2-inch balls, placing each dough round onto one of two parchment paper—covered, large cookie sheets. Bake until cookie edges turn golden brown, 22 to 25 minutes. (Halfway during baking, turn cookie sheets from front to back and also switch them from top to bottom.) Slide cookies on parchment onto cooling rack. Let cool at least 30 minutes before serving. Good news: my swollen finger joint is better. Bad news: After over a week, my on-again/off-again cold has dug in to stay. I have a small colony of frogs living at the base of my throat and they get really active at night. I am determined to kick this thing to the curb. I’m going to throw so much $h1t at it that it will have to bow down. I am still in pajamas and convinced my 9yo to make his own lunch (his dad helped) and my husband worked from home today, and took the kids to the bus stop so I didn’t have to. I don’t plan on leaving the house for the foreseeable future. Laundry and cleaning can damn well wait till I’m solidly better. Like, next week, maybe. Also the Tournament of Books started today, so I better get reading. I used to chew a raw clove of garlic, but the last time I tried it I vomited it right back up (it’s that gross), so, lesson learned, no more of that. I may make myself grape Jello water instead. A warming drink with echinacea, plus a kick of ginger and cayenne to clear the sinuses? We’re in. Makes 1. Recipe by Moxie Rx in Portland, OR. *Screw agave. It’s a fad. Sugar is sugar, except when it’s local honey, which is better for you. Use local honey. **Use your Microplane grater. If you do not have one, fix that. ***Super echinacea extract can be found at natural foods stores. Combine all ingredients in a mug with 1 cup boiling water, stirring until honey is dissolved. Let sit for 1 minute before serving. I have had a crazy-town banana-pants week, with all three book groups meeting and four articles to turn in. Thus, no posts last week. I am emerging from under my rock, though. One of the articles is up at Simple Good and Tasty, on L.C. Finn’s flavor extracts, which I used to make Pumpkin Spice Muffins and Anise Biscotti. Impossible Pumpkin Pie–no crust needed! Place all ingredients in blender; blend for 2 minutes. 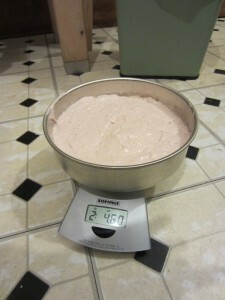 Pour mixture into pie plate and bake for about an hour, or till center is set and tester comes out clean. Cool. Serve with vanilla or ginger or cinnamon or cardamom or maple whipped cream. Yet most of us also harbor happy childhood memories of coming home from a night of trick-or-treating with a pillowcase or plastic pumpkin full of goodies. The enjoyment was extended by sorting candy, trading it, and slowly (or not-so-slowly) consuming it over the next several days. It’s good to remember that there is joy in this candy-centric holiday that can easily get stifled by well-meaning adults. 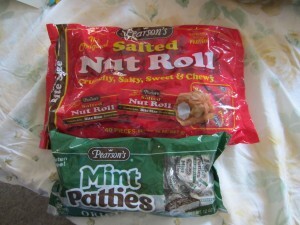 Yes, those are Halloween-sized Pearson’s Salted Nutrolls and Mint Patties! Bat-black dots that are BLOOD-orange flavored–how clever is that? 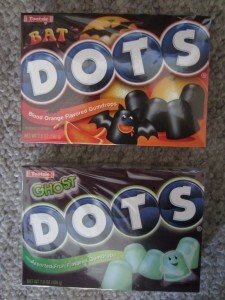 In case you’re wondering, both Drake and Guppy declared that the bat dots were better than the ghost dots. Also, 2 our of 3 of us declared Pearson’s mint patties better than York. And, Drake is wrong, so it is really unanimous. This is the end of Halloween candy buying. Really. I mean it. 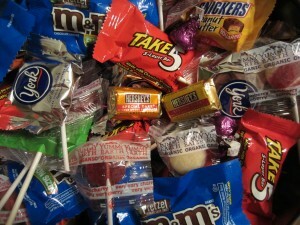 I’ve been writing about Halloween Candy, and detailed my tops picks at Minnesota Monthly’s TC Taste Blog. Every year we run out. This year might be different. What’s your favorite Halloween candy? I did a poll of the bus stop moms and was surprised to find two of my most-hated candies were picked as most loved by others: candy corn and Three Musketeers (nougat=blerg). To each her own; vive la difference! “That doesn’t look like banana bread,” my husband G. Grod remarked. 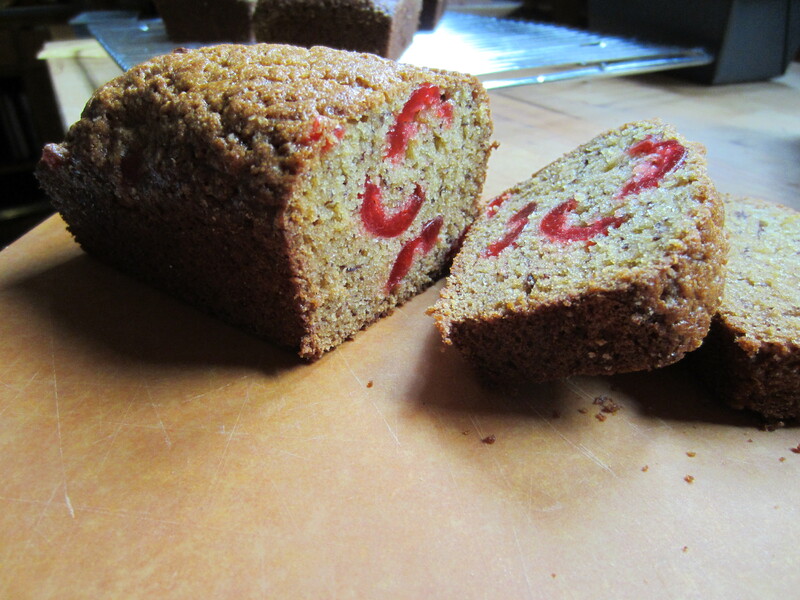 My normal banana bread recipe has maraschino cherries in it, which makes it fairly easy to identify. “New recipe. Smitten Kitchen,” was all I had to say. G. and I celebrated our 14th wedding anniversary last week, which I unintentionally made a big deal of by putting a couple things on facebook and now here, so forgive me if I seem to be going on about it, but I have to say it’s one of those nice things about being married to someone for so long that I can just say “Smitten Kitchen” and he knows what I’m talking about. Then again, there are probably at least half a dozen friends who would get that, too. So maybe I am just flagrantly boasting about our anniversary. Sorry. Anyhoo. 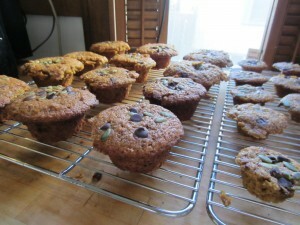 I’ve been making Marvelous Metropolitan Millet Muffins for a while, so I am a fan of millet and was eager to try the new combination. I took it to a sukkot party this weekend, and people really liked it. I’m not going to give up my normal banana bread recipe. 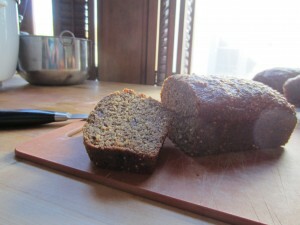 And after mentioning to G. Grod, I may also try SK’s Jacked-Up banana bread. It’s good to switch things up once in a while. My grocery co-op sells uncooked millet in the bulk aisle. Whole Foods and their ilk would likely have it, too. Preheat oven to 350Â°F. 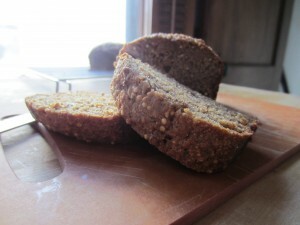 Place millet on rimmed baking sheet and toast for ten minutes, shaking once or twice, while oven warms. 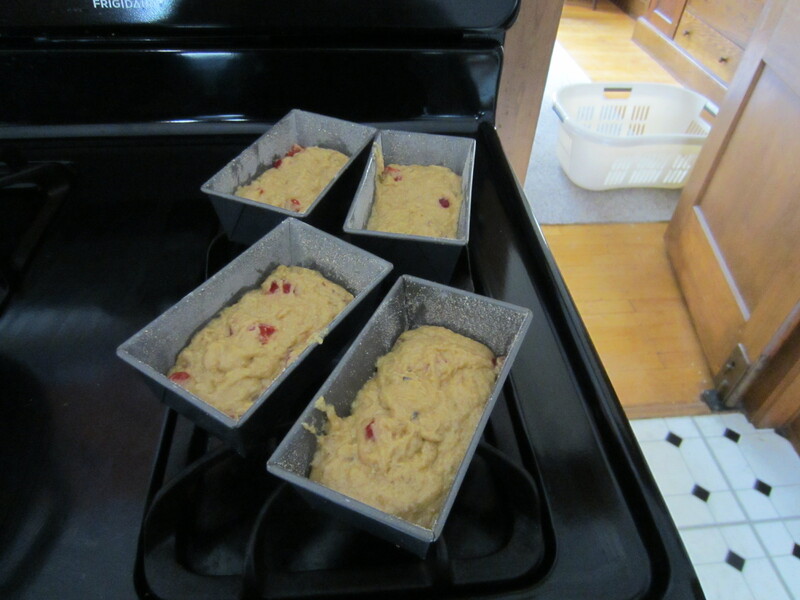 Butter and flour 9Ã—5-inch loaf pan or 3 mini loaf pans. In the bottom of a large bowl, mash bananas with a potato masher (smoother) or a fork (more toothsome/lumpier). Whisk in egg, then oil, sugars and vanilla extract. In medium bowl, whisk together soda, salt, cinnamon, ginger, nutmeg, cloves and flour, then millet. Sprinkle over wet ingredients and stir till just combined with no streaks of flour. Pour mixture into prepared pan(s) and bake until a tester comes out clean, about 40 to 50 minutes for a large loaf, about 30 for mini loaves. Cool loaf in pan on rack for five minutes, then remove from pan and let cool on rack. Serve warm or at room temperature. Summer is kind of over–9yo Drake and 6yo Guppy boarded the school bus this morning, and I’ve spent the day reading, writing, staking floppy tomato plants, weeding, and doing laundry while through it all revelling in the peace and quiet. I never knew how much I disliked noise and mess until I had a child. Then another. Both boys. But anyway. I had a lightbulb moment earlier this summer and added a splash of cold-brewed coffee to a glass of fizzy water, and I’ve been drinking it ever since. 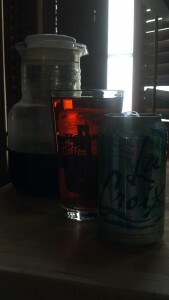 Twelve ounces fizzy water (I favor La Croix plain) with an ounce or two of cold-press coffee are two great things that go great together. So even though the kids are back to school, leaves are falling and the squirrels are leaving walnut casings on the sidewalk, I think I’ve still got a few more weeks of warm weather to keep enjoying this. 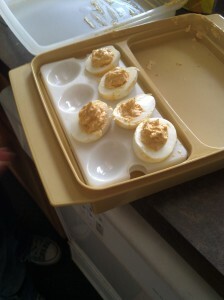 I grew up in a family that made deviled eggs for special occasions. There was never a recipe. What I remember is a series of steps: boil eggs, peel eggs, halve eggs, put whites on fancy deviled-egg dish, put yolks in bowl, add mayonnaise, mustard, salt, pepper and horseradish as a matter of course, then possibly experiment with things like vinegar, hot sauce, and, one unfortunate time, wasabi. Make sure everyone in the house tastes it to offer input, then put into plastic bag, pipe into egg-white halves, and put leftover yolk mix on crackers, usually Triscuits. As an adult on my own, I don’t make deviled eggs as often as my family does. My kids don’t (yet) like them. But yesterday on Easter, I felt the pull of tradition. I unearthed the Harvest Gold Tupperware egg transporter (I have three other egg serving dishes) and got down to the serious business of making eggs. I was motivated by three recent articles–one from the Genius Recipes series at Food 52, and two from my husband G. Grod, one on baking eggs rather than boiling them, and another on using Sriracha sauce in the filling. Baking versus boiling? A success. I put a cookie sheet below the baking eggs in case they ’sploded, but no eggs were harmed in the process. Were they easy to peel, you ask? More than half of them were, but easy-to-peel is more a function of egg age than of cooking method. I’ve tried poking a hole with a push pin, storing eggs on their sides, and pretty much all the methods, but the best thing is old eggs, where the inside membrane is drying out. Peeling under a thin stream of running water at the sink helps a bit by making a little space between the shell’s membrane and the egg. Next up was making the filling. I only had a few eggs to work with, as I’d made the Hell’s Kitchen 9-egg lemon-ricotta hotcakes for breakfast, so I had to do some fiddly math to get proportions right, but they tasted good, with a nice slow burn at the finish. And they looked pretty and orange-y. Until they fell off G Grod’s cargo bike on the way to a friend’s house. We were able to rescue most of them, and I cleaned them up a bit for the below photo. In spite of their looks, they went fast. I’m going to make a lot more, next time. And not drop them. To cook the eggs: Put oven racks in middle of oven. In cold oven, place eggs directly on rack. (You can put a cookie sheet on the oven floor if you’re worried they’ll explode; mine didn’t.) Set oven to 325F. Set timer for 30 minutes. Prepare ice bath. When 30 minutes have passed, remove eggs with oven mitts or tongs and put them in ice bath for 5 minutes. When pouring out cold water, jostle eggs to crack the shells. Peel. Halve. Place egg whites on plate or tray. 1. 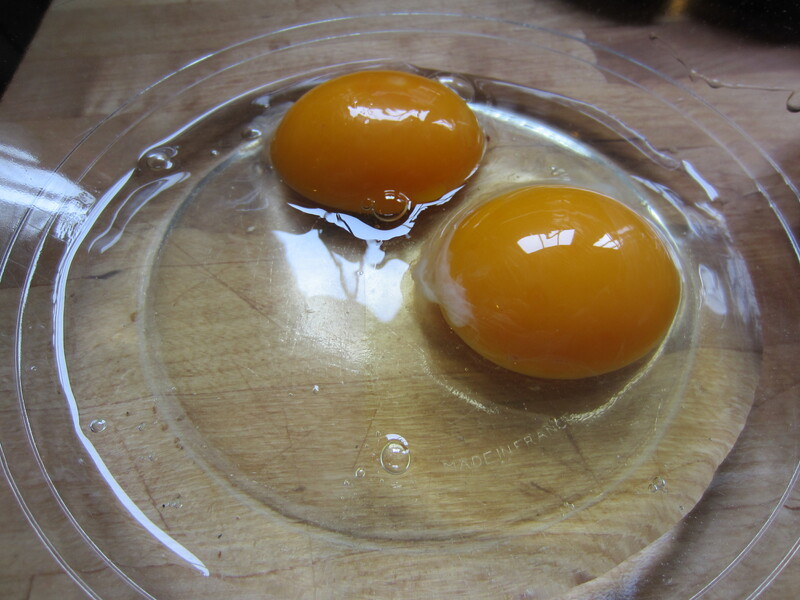 Put yolks in mesh sieve over large bowl. With rubber spatula, press through mesh. Add mayonnaise, butter, mustard, Sriracha, lime juice and salt. Taste, and adjust as needed. 2. Transfer mixture to plastic bag. Snip off corner. Squeeze filling into egg whites on tray. 3. Eat the ugliest egg to make sure they’re good. Repeat as needed to reassure yourself. Share with friends. If you want to. 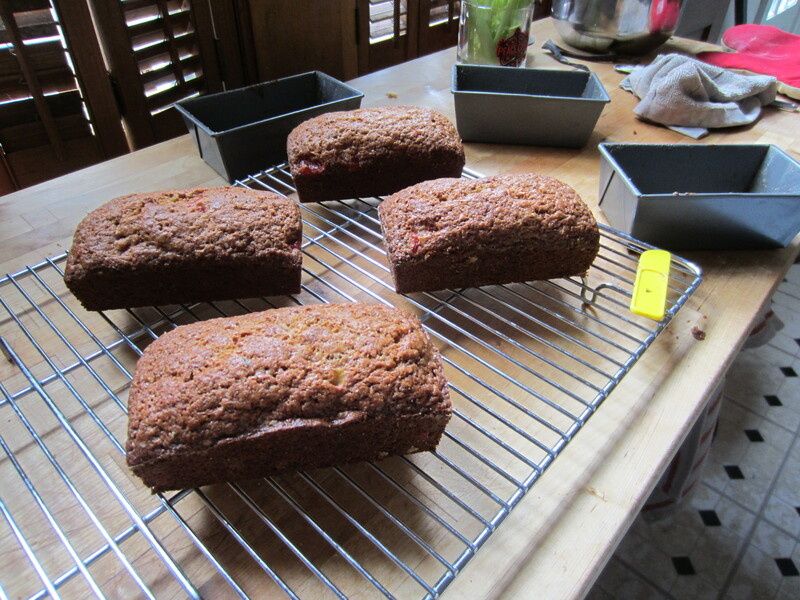 Over at Tipsy Baker, Jennifer Reese has been writing about making banana bread here and here. She describes her ideal bread as having a custard-y texture. I like a heavy, moist banana bread, but a custard-y texture is going too far for me. Why not just make bread pudding out of banana bread rather than pudding-y bread? But to each her own banana bread, and it got me thinking about my own. Melted butter. I put a stick of butter in the microwave for 30 seconds, which leaves bergs of butter then stir with a fork till the warm butter melts the bergs. I used the chemically colored/flavored/sweetened cherries but not the organic vanilla in deference to the original recipe. That said, I haven’t been wholly faithful to the recipe over the years. 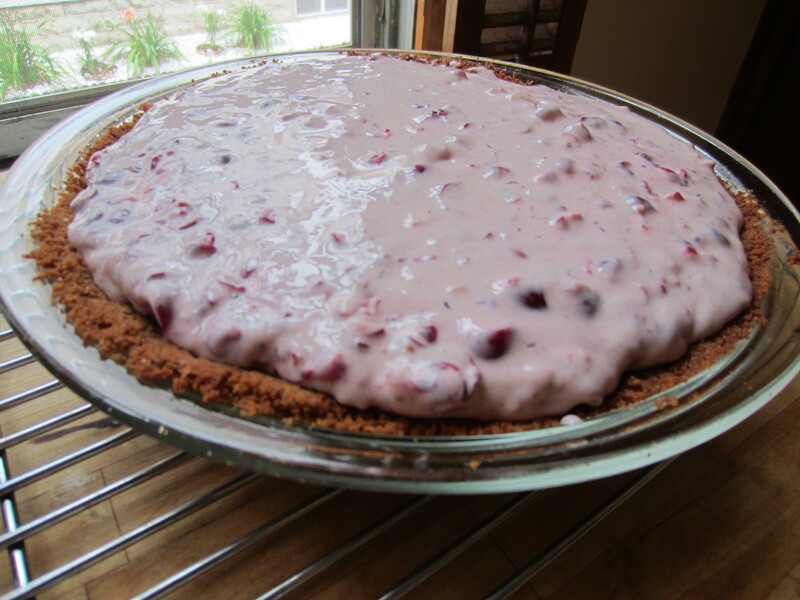 A note that says to add the “juice” of the cherries to the recipe, which already has a cup of sugar, made a wet mess that took two hours to bake with a crust that had to be swathed in plastic wrap to soften it. (I put juice in quotes because the liquid the cherries are in is an unholy combination of chemicals that I only wish I could pretend was merely sugar water.) And the most curious instruction, to me, was to dissolve a teaspoon of baking soda in a tablespoon of warm water. I’ve never seen this instruction in any other recipe, and it makes me wonder if somewhere back in the old days there was a problem with clumpy soda. Black-enough bananas. 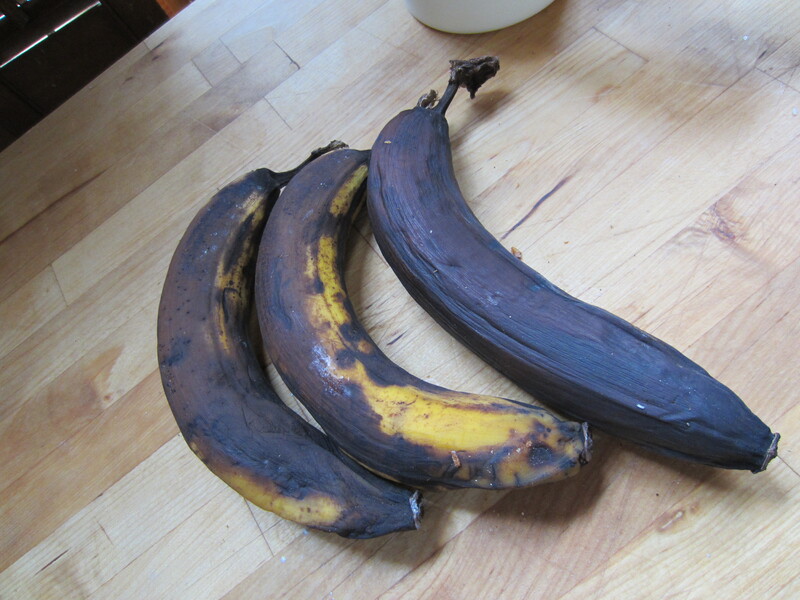 If your bananas aren’t this gross, you can roast them in the pre-heating oven. But as I considered banana bread and looked at the tweaks I’d made to the recipe over time (a hybrid of my family’s recipe with one from Cook’s Illustrated) I realized what I had was really no longer my great-grandmother’s recipe. So I called my grandmother and aunt to answer a few questions, and learned that while it is the recipe our family has been making for generations, it is not my great-grandmother’s, but instead someone named Henrietta. 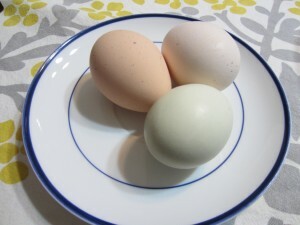 Eggs from happy chickens. Really–they have names and their owner pets them. My 97yo grandmother wasn’t clear on the exact relation to Henrietta, but I think she was a cousin, so I feel perfectly justified in continuing to refer to this as our family’s banana bread. Buttered, floured sides give the bread something to cling to as it rises. After this consult, where we checked the recipe against the one written on a flyleaf of my grandmother’s Joy of Cooking, I decided to make the original recipe again, without the Cook’s Illustrated tweaks to the ingredients. But I couldn’t help but add some whole wheat flour, skip the dissolving of the soda, plus melt rather than cream the butter, which makes for a very easy, two-bowl, mix-by-hand batter. I was quite torn about vanilla, which the original recipe doesn’t have but I usually add. But I steeled myself to omit it in the interest of science. Or historical accuracy. Or whatever. Why yes, I _do_ use a Play-doh knife to take the loaves out so I don’t scratch the non-stick pans. Alas, I was a little too clever. I divided the batter into four mini pans so they’d bake faster and the crust wouldn’t grow too thick. But I let them overbake a bit. The results were good, but a bit dry. I’m going to have to try again before I declare the original recipe a winner. How about you; what’s your ideal banana bread, or your family recipe? 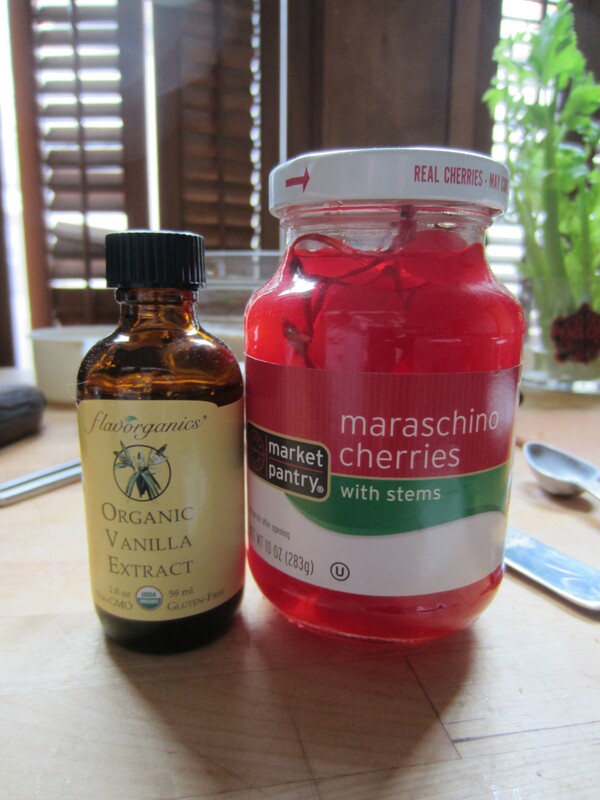 1 small jar maraschino cherries, stems removed, rinsed and torn in halves. Preheat oven to 350. Butter and flour loaf pan(s). In medium small bowl, stir butter, eggs and bananas together. In medium large bowl, whisk dry ingredients together. Lightly fold banana mixture and cherries into dry ingredients with rubber spatula until just combined. 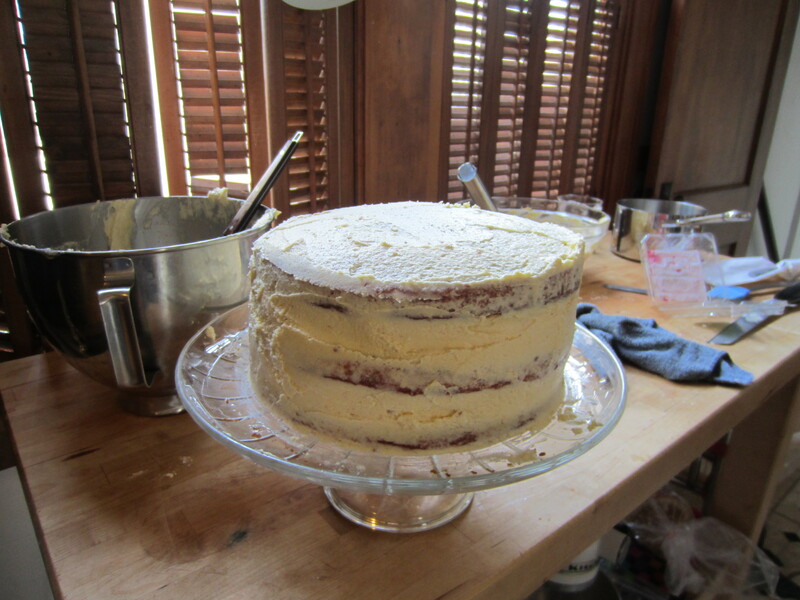 Batter will be thick and chunky but there should be no flour streaks. Scrape batter into pan(s) and bake till golden brown, about 55 minutes for a large loaf, or 40 minutes for small ones. Tester should come out clean. Cool in pan 5 minutes, then on wire rack. I waited a while on the reserve list at the library to get the Momofuku Milk Bar baking book by the chef at the famous NYC bakery. I was excited to try some of the recipes. Till I read them. I paged through the entire book, and think I found two that didn’t include glucose, or other odd ingredients like corn powder. This is a book that doesn’t translate well for this home chef, who doesn’t want to go anywhere special or online for special ingredients, or use corn syrup or glucose rather than cane sugar. Next time I’m in NYC, though, I’m totally visiting. The stories, photos, and baked goods are stunning. I was a fan of Jennifer Reese’s when she was books editor at Entertainment Weekly. When they downsized books, though, they let her go. 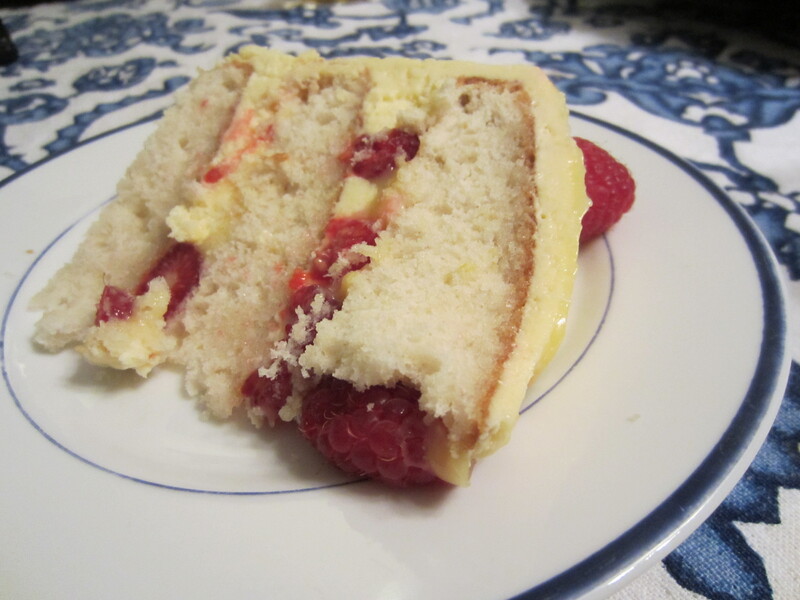 I did some searching, and was happy to find her blogging online at Tipsy Baker. She’s recently taken many of her home-economics-gone-mad escapades and written them up, along with recipes, in Make the Bread, Buy the Butter, which I reviewed earlier this week at Simple Good and Tasty, one of the other sites I write for. For each food, Reese advises whether to make it or buy it. Granola? Make. Grape nuts? Buy. Hot dog buns? Make. Hamburger buns? Buy. Mayonnaise? Both. Like most modern food lovers, Reese values seasonal, local, sustainably produced foods. But she’s not a harsh ideologue. She acknowledges that sometimes you’re up for making things from scratch and sometimes you’re not. It’s a cookbook as well as a charming food memoir. Highly recommended. Have Bike. Am Hungry. Will Travel. As I wrote before, I thought once my younger son started kindergarten, I’d spend the time writing and keeping house. This hasn’t happened. Instead I’ve been biking and eating. I had every intention of staying in today and doing Useful Things. Then I saw a photo my friend Amy shared on Facebook of duck soup. The sun was shining. My bike’s tires were filled with air. It was time to go. Ten-plus miles later, I got the second to last bowl of rich broth filled with squiggly noodles, bok choy, broccoli, a poached eggs, and local duck. I sat in the sun and slurped it down. Where I Went and What I Ate: St. Paul (about 10.5 miles each way.) Duck soup from Chef Shack food truck. $10. Another thing I’m a fierce fan of is caffeine with a carb for breakfast. Perhaps it’s my Italian heritage. I’m a carb monster, so breakfast for dinner is one of my favorite things, ever. Alas, my husband cries foul on the dodgy nutrition, so I took advantage of his absence last night and tried a new recipe for waffles. It’s part of a series of “genius” recipes they’re spotlighting at Food 52, and which I’m watching with interest given it included my go-to pasta sauce, Marcella Hazan’s Tomato Sauce with Onion and Butter (I don’t even like onion!) Aretha Frankenstein’s Waffles of Insane Greatness are easy to make, smell amazing while cooking, and are utterly devourable. We didn’t have a crumb left. For better nutrition, I did serve the waffles with sliced strawberries and cucumbers, kale roasted with olive oil and salt (yeah, the kids wanted nothing to do with this), and a Black and Blue (berry) smoothie with silken tofu. This recipe (originally from Aretha Frankenstein’s restaurant in Chattanooga, TN) is the ideal I-just-woke-up-from-a-waffle-dream waffle, a morning-of alternative to the overnight yeasted kind. The cornstarch in the batter helps tamp down gluten formation, making these waffles silky and moist inside with a crust as thin and crisp as an eggshell. 1. In a medium bowl, combine the flour, cornstarch, baking powder, baking soda, and salt; mix well. Add the milk, vegetable oil, egg, sugar and vanilla and mix well. Let the batter sit for 30 minutes. 2. Heat a waffle iron. Follow the directions on your waffle iron to cook the waffles. Serve immediately with butter and pure maple syrup or hold in a 200 degree oven, directly on the rack (don’t stack them or they’ll get soggy). These also reheat very well in the toaster. As you may know, I like a little smackerel of something around 3ish. Today I dunked graham crackers into Earl Grey tea, hot, with milk and sugar. It was good. Interestingly, graham crackers with coffee? Not good. Newman O’s (i.e., “more healthful” Oreos) with coffee? Tremendous. Newman O’s with tea? No. The beverage/cookie balance is more tricky than one might think.